Today we're releasing two brand new, never-before-seen kigurumi onesies. The first one is a super cute bunny rabbit with big floppy ears and a tail. The second one is a... erm... big floppy eared bunny rabbit, which is super cute. Can you tell which one's which? Answers on a postcard please. 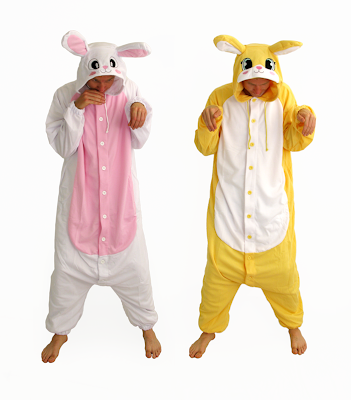 Seriously though, these bunny kigurumi costumes are utterly adorable. The yellow one with it's innocent expression, and the white one with it's slightly more crazed bunny face. Unlike other bunny onesies we've seen, their ears manage to stay upright most of the time - the photos above were taken without any kind of ear-propping-up device. They also have a very cute bunny tail at the back. They are the perfect gift for Easter, so we're releasing them in October - that's what you get when your Chief Business Strategy Adviser Executive, is sitting around in a bright yellow bunny onesie, eating carrots and trying to poop pellets. You can get the yellow bunny onesie here, and the white bunny onesie here.